Envoy Hostel & Tours launched its very first Social Hub Market on Saturday December 16, 2017. This was a fun event with a worthy cause. Envoy Hostel & Tours has a heart to make a positive change in local communities. This motivation subsequently led to the idea to gather like minded organisations together and start the Social Hub Market. The event provides the opportunity for social enterprises to showcase themselves in the one location. Invited organisations each have a clear vision of helping Cambodian communities in different ways. In addition they also offer unique, hand crafted products by training and empowering locals. In total eleven socially responsible enterprises took part in this first event which provided a variety of exciting items. For example products ranged from jewelry to handbags and from clothing to footwear and more. Food, drinks, music – fun! The market night had a fantastic atmosphere. Entertainment was by the talented students of the Royal University of Fine Arts, providing toe tapping music. There was delicious food by the environmentally conscious Eleven One Kitchen. Refreshing drinks served by Lot 369 connected with SHE Investments. Ultimately, the aim of the Social Hub Market is to build a bridge between Cambodian communities and travelers. The foundation of this bridge are clearly established after this first event. Now it is time to build it up! Even local media has recognised the success of the Social Hub Market. For example both the local Khmer Times and Le Petit Journal have written articles about the event. Envoy Hostel & Tours plans to have the Social Hub Market event on a regular basis. The next one will be held in January 2018. The plan is to invite other new NGOs to take part to provide further opportunities. Likewise we hope to expand our event and attract even more interest leading to a bigger positive impact on our local communities. … each organization which took part in the event for their support and care. 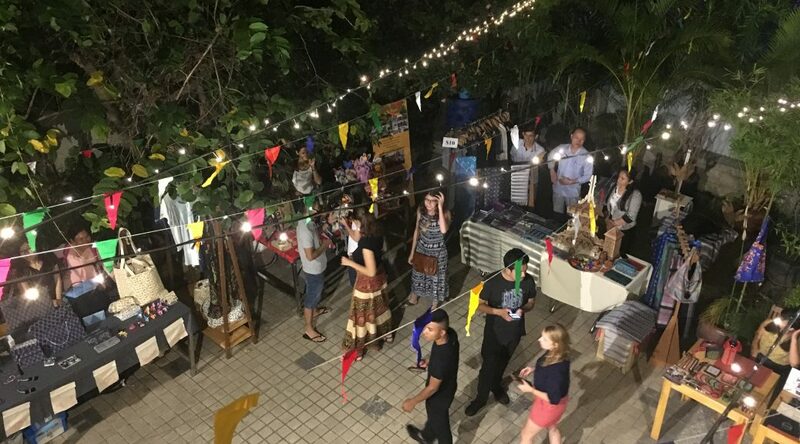 Here is the full list : Amboh Espadrille, Angkor Bullet Jewelry, Smart Crafts, Samros Soap, Dai Khmer, Bumi Bags, Fair Weave, Watthan Artisans Cambodia, Susu Cambodia, Nomi Network and Code Eau Khmer. Furthermore we are very thankful to our visitors and guests of our hostel for showing their support by buying the beautiful products. Make sure to join the fun next time. Enjoy your shopping, meet new friends, and most importantly, help us help others. Remember, together we can make a difference so lets be the change we want to see in this world! Previous PostGeorgian Food PartyNext PostBallet Around the World!